Subsequent to the Christchurch earthquakes, generators for infrastructure services are now frequently being specified to incorporate seismic mounts. The Christchurch wastewater treatment plant now has a MTU 650 kVA standby generator supplied by Powergen. The generator is enclosed in a weatherproof and sound attenuating container, and is mounted on AMC seismic vibration isolators to minimise structure borne noise and vibration, and to provide safety and stability in the event of further seismic disturbances. 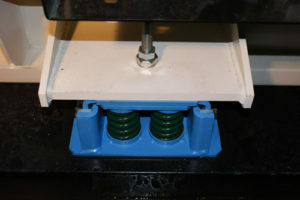 At normal operating speeds, the mounts will provide over 95% vibration isolation.